The Advisors Sentiment report surveys the market views of over 100 independent investment newsletters (those not affiliated with brokerage houses or mutual funds) and reports the findings as the percentage of advisors that are bullish, those bearish and those that expect a correction. The report has been widely adopted by the investment community as valuable anecdotal evidence as to extremes in investor confidence: conditions which are often seen at major market turning points. When Abe Cohen, founder of Investors Intelligence, devised the Advisors report in 1963, he had in mind that the results would alert him to conditions when a majority of advisors had become bullish thus providing a relatively good signal to increase exposure to the market. This turned out not to be the case as, after several years of comparing his data to the subsequent market action, Cohen became aware that the best signals from his data were in fact contrarian in nature: when a relatively high percentage of advisors were bullish, it provided a good signal to exit the market. Before discussing the sentiment report in more depth, it is probably relevant to look at the theory behind contrary investing. The contrary investor studies crowd behavior in the stock market and aims to profit from particular conditions where investors act on their emotions rather than reason. Such extremes of fear and greed are often seen at major market turning points, providing the astute contrarian with opportunities to both enter and exit the market with aplomb. Crowd psychology has been observed for many years and unfortunately, as investors, we provide rather ideal “laboratory rats” for its study. In 1841, Charles Mackay published a book entitled “Extraordinary Popular Delusions and the Madness of Crowds” in which he sited phenomena such as the Dutch Tulip Mania and the South Sea Bubble as examples of this form of mass investment hysteria. It is hard to dispute that investors instinctively like to adopt a popular theme on which to base their strategy and in his book Mackay noted that “men think in herds…go mad in herds (and) recover their senses slowly, and one by one”. In other words, once we begin to think with the crowd, our reasoning becomes irrational and based on the emotional impulses of that crowd rather than on our own capital-preserving instincts. Another legendary contrarian was Humphrey B. Neill whose book “The Art of Contrary Thinking”, published in 1954, helped popularise this strategy for investment. He too observed that “when everyone thinks alike, everyone is likely to be wrong”, and promoted the practice of “throwing your mind into directions which are opposite to the obvious”. Neill provided much practical advice on how, and importantly when, to apply contrary thinking. He was happy to admit that the public is right more of the time than not and concluded that “the crowd is right during the trends but wrong at both ends”. In other words, as a market trend develops, there is still a dichotomy of views amongst investors and it is not until these views become extremely uniform that investors resemble a crowd. This was aptly described by Sir John Templeton “bull markets are born on pessimism, grow on scepticism, mature on optimism, and die on euphoria”, the extremes in this case being pessimism and euphoria. When does the crowd get crowded? If Mackay and Neill were correct in their observations as to crowd behavior then, could Cohen have stumbled upon a means of identifying conditions when such behavior was at an extreme? The answer to this question is dependent on whether or not the Advisors surveyed in the report act as “the crowd” or rather as “experts” who are emotionally divorced from the irrational exuberances often shown by the investing public. 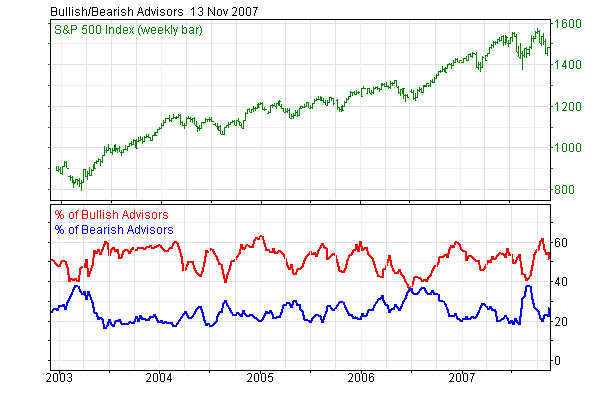 The historic sentiment readings show that Advisors views do indeed follow general market sentiment. They do after all (subconsciously or not) have to satisfy a market-orientated readership, being generally reflective of market optimism during uptrends and pessimistic during market declines. there had been none since prior to the October 1987 crash until 1999 when bullish readings surged above 60%, a pre-warning of “irrational exuberance”. another extreme bullish reading above 60% occurred in 2001 which suggested that many Advisors were still stubbornly “buying the dip” as had been appropriate during the bull market. Bulls surged to a 17-year high late December 2004, at 62.9% – Almost a year was to follow before the S&P500 was able to make a clear break above the subsequent sidways action. Seven bearish readings above 55% occurred during the economic recession in 1990, the market subsequently made its lows in October 1990 and then climbed strongly after the start of the Gulf War in Feb 1991. Two bearish readings above 55% occurred in 1994 prior to the commencement of the uptrend that took the Dow Industrials from 4,000 to 12,000 over a six year period. Producing the weekly sentiment poll is a daunting task. The Advisors’ market stance is taken from the same products that are received by their clients being either printed newsletters, email bulletins or views published on a website. Most letters are composed weekly, with some intra-week updates and a few bi-weekly or monthly. Over 100 advisors are currently polled, some have long term track records, others come and go. The list of Advisors is regularly reviewed and new sources of opinion are sought through Barron’s or web searches, but several years of continuous publication is required before a newsletter is included. Determining the Advisors’ views is a largely subjective exercise but there have only been four editors since the poll was devised in 1963, and just two since 1982, which provides a consistency of approach. The poll editor aims to follow the advice the newsletter is communicating to its subscribers when they read them. What are they telling readers to do? If they have a list of stocks to buy now they are bullish; if they say sell everything and raise cash they are bearish; if they show a list of stocks to buy, but at lower prices, they are judged as “correction” status. Most judgement is exercised when comments are ambiguous with both bearish and bullish arguments and in these cases, the current stance is compared to what the Advisor had said previously, looking for changes. The historical evidence does suggest that the Advisors Sentiment data provides evidence of extremes in market confidence and that these extremes are, more than not, present around market turning points. However, bear in mind that this is anecdotal evidence of how advisors feel towards the market not necessarily how they, or their readership, acts. The resultant signals derived from the report are therefore often early warnings that should not be ignored but that should be applied in conjunction with other tangible forms of analysis that identify current market action such index trends and market breadth.